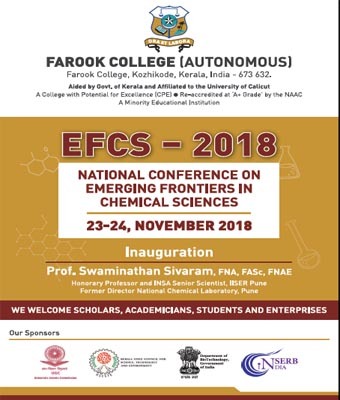 Department of Chemistry, Farook College is organizing a conference series named, "Emerging Frontiers in Chemical Sciences (EFCS)”. The conference would be an international event biannually, with a national event in-between. The first national conference in this series (EFCS 2018) is scheduled to be held during 23-24 November 2018. The first international conference in the programme (EFCS-2017) was held during September 23-25, 2017, and the series was inaugurated by Prof. C.N.R. Rao. EFCS is a high-quality venue for researchers in all branches of chemistry. The conference is intended to provide a platform for young researchers and science aspirants to communicate with international and national experts. This also aims to provide a link between the college and the outside world in the broader areas of chemical science. It will act as a forum to unite the chemical community in the region, spread across various institutions. The conference will be held at the Audio – Visual Theatre (AVT), Farook College, Calicut. Farook College is situated on a lovely hillock 5 km from Feroke railway station, 16 kms from the city of Calicut. If one goes by road, one has to take diversion from Chungam on NH 17, a junction on the road connecting Kozhikode and Malappuram districts. The college, which is 1.6 km from Chungam, and 1 km from Calicut bypass near Azhinhilam, is at a distance of 16 km from the Calicut airport situated in Karipur.